Figure 7.35 Diagram showing stratigraphic ranges of most common plant microfossil taxa at the Morgan Creek locality. Black bands = coal; question marks indicate uncertain limits in some stratigraphic ranges because of coarse sampling interval (from Nichols et al. 1986). Reprinted by permission. flora underwent an extinction event. The species involved in the extinction varied at different localities, but notable among those disappearing were pollen types such as Aquilapollenites that Jerzykiewicz and Sweet (1986) characterized as morphologically exotic. Shortly thereafter, Sweet and Jerzykiewicz (1987) introduced the hypothesis that relatively large and morphologically complex pollen was produced by entomophilous (insect-pollinated) plants. 3 2 o fgh Divide Ridge Congl. Figure 7.36 K-T boundary interval at the Coal Valley locality, Alberta Foothills (modified from Jerzykiewicz and Sweet 1986). Reprinted by permission. precipitation and by ecological successions in plant communities that were independent of the K-T boundary event. The localities discussed in detail by Sweet et al. (1990) were the Judy Creek 83-313 A corehole (locality 67) and the Police Island outcrop section (locality 84). Sweet and his colleagues asserted that circumstances and events affecting plants leading up to and following the K-T boundary event were, in essence, overwhelmingly complex. 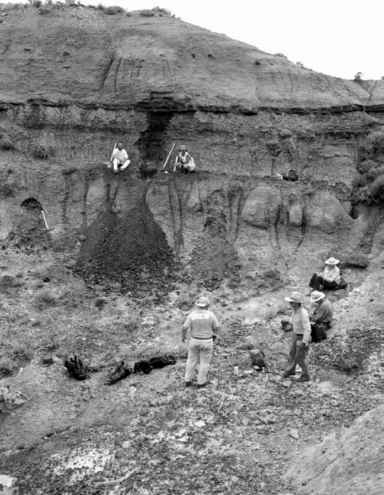 The extinction event at the boundary was recognized, but it was not viewed as anything other than one in a series of complex sedimentary, paleoenvironmental, and paleocli-matic changes that occurred from latest Cretaceous to early Paleocene time.